November 16, 1998: High above the clouds on November 17th a NASA weather balloon will lie in wait for the Leonid meteors. The goal: to capture a meteoroid and return it to Earth intact. "The chances of success are small, probably less than 10%", says Dr. David Noever, the project leader at NASA's Marshall Space Flight Center, "but of course the payoff is rather huge." 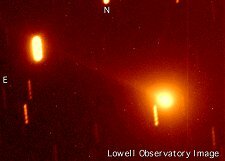 One of the goals of the experiment is to see if the "Stuff of Life" -- organic compounds and other molecules -- are present in the debris of comet Tempel-Tuttle, the source of the Leonid meteoroids. Right: An image of comet Hale-Bopp in 1997. 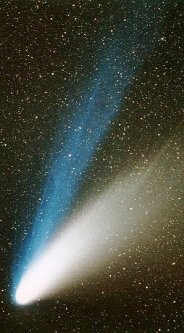 The spectacular tail consists of ice and dust that bubble off the comet's nucleus as a result of solar heating. This debris orbits the sun along with the comet, forming a thin elongated stream of meteoroids, like the one that causes the Leonid meteor shower. The Leonids are debris from comet Tempel-Tuttle which passed Earth earlier this year. Amino acids and other organic molecules necessary for life as we know it on Earth are thought to be common in meteorites and comets. While life probably doesn't thrive inside comets, the compounds they carry might have contributed to the genesis of life on Earth billions of years ago. Scientists would like to know whether the comet, which passed Earth just last January, contains organic compounds, and if organic molecules are created when a Leonid meteor burns up in Earth's atmosphere. Sign up for our EXPRESS SCIENCE NEWS delivery To answer these questions researchers from the Marshall Space Flight Center hope to capture a piece of the comet Tempel-Tuttle. Tuesday's meteor storm is like "room service for science", says Dr. David Noever, a member of the Astrobiology Institute. "Instead of us going to the comet, it's coming to us." Scientists will use a particle collector made of aerogel carried aloft on a helium-filled weather balloon. Weather permitting, the balloon is scheduled for launch from the Marshall Space Flight Center at 2 am Central Standard Time on November 17th . The payload will include a meteoroid collection device, and a CCD video camera. The balloon will spend up to 4 hours aloft and reach a maximum altitude of 100,000 ft.
High above the clouds and far away from city lights the view could be spectacular. Live video from the flight will be available to the public at Leonids Live! in RealVideo format beginning approximately 0800 UT November 17th (0200 CST). Video and images from the NASA's East Asia plane flights will also be posted at that web site. Aerogel is the lightest known solid, and is considered the best substance available for capturing fragile particles from a comet without damaging them. When a high-velocity dust particle hits the aerogel, it buries itself in the material, creating a carrot-shaped track up to 200 times its own length. Since aerogel is translucent scientists can use these tracks to find the tiny particles. The track is largest at the point of entry, and the particle can be collected intact at the point of the cone. Above: This photo from a laboratory experiment shows the cone-shaped track made by a tiny high-velocity particle in aerogel. The captured particle is located just beyond the narrow end of the cone. Photo credit NASA/JPL. The sample collector on tomorrow's balloon mission will consist of twenty-four 1" diameter circular wells of aerogel films clustered in a 6"x4" payload. The aerogel has a mean density around 0.08 g/cc and is semitransparent. The total weight is less than a few ounces (mainly container and structural supports, not aerogel), so it should have a negligible effect on the flight of the balloon. Right: Aerogel Capture Experiment Hardware. 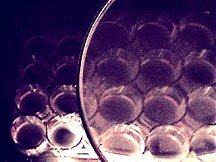 Magnification of sample wells containing low-density silica capture media." According to Dr. David Noever, "The drawback I see is that we are forced to catch everything from ground to 100,000 feet, mainly because we do not have time to fashion a remote control door that opens or closes to expose the capture media. This experiment should be considered an engineering test, and we'll make improvements prior to the 1999 Leonid shower." The Leonids Return Mission is an interesting prelude to another NASA mission with possible connections to Astrobiology: the Stardust Mission. Stardust is a spacecraft, scheduled for launch in early 1999, designed to collect and return to Earth particles flying off the nucleus of Comet Wild-2 in January 2004. It will also bring back samples of interstellar dust including the recently discovered dust streaming into the solar system from other stars. The spacecraft will count the comet particles striking the spacecraft, and produce real-time analyses of the composition of the material coming off the comet. Like the Leonids balloon flight, Stardust will use an aerogel-based collector to capture bits of the comet. "The transparency of aerogel is critical to the success of Stardust; tracing particle tracks by eye or microscope requires a reasonably clear material", explained David Noever. Aerogel made on earth is not perfectly transparent because of irregularities in the pores which permeate the substance (aerogel is 99% empty space). There is some evidence that aerogels manufactured in low gravity are much clearer, and an experiment was just conducted on space shuttle mission STS-95 to test the idea. "Space-manufactured aerogels could significantly improve our ability to capture comet particles," commented David Noever. "Using centrifuges we can make aerogel with a density gradient: low density on one side for low damage particle capture, backed by a denser section to insure nothing escapes out the other side. This kind of thin-to-dense aerogel is unique in this dust capture business and may be unique to the way we make aerogel in space. It's an open question at the moment." When Stardust swings by Earth in January 2006, the aerogel samples encased in a reentry capsule will be jettisoned and parachute to a pre-selected site in the Utah desert. For this year's Leonid meteor storm Science@NASA will be collecting observations from amateur observers, including meteor counts, pictures, and video. We plan to use your observations as the subject of a Science News Headline on November 18th or 19th. If you would like to participate simply follow the simple instructions about how to observe and keep records. Then, after the shower, return here to submit your data.